Pressurized tanks and other equipment require special handling. Gas or liquids under pressure can be dangerous to handle, and the vessels themselves are liable to some problems. Understanding the different parts of pressurized equipment and how they work, and how they work within the larger pumping system, is essential. While different operations need different equipment, some pressurized equipment is going to be common to almost all pumping operations. These include the separator and the heater-treater, both of which are part of the process for separating oil from water and gas. Flow lines and the header used to control flow are also usually under some pressure. Figure 1. 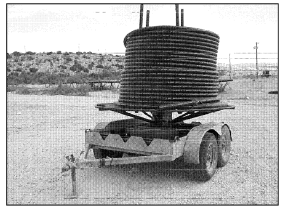 Polyethylene piping for a flow line. 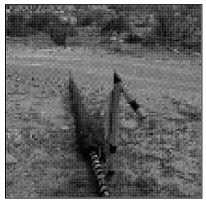 The surface pipeline from the wellhead to the tank battery is called the flow line. The choice of material for the flow line is important, with different options being best suited to different situations. Steel is a common option for operations with wells that flow naturally or have a high pressure flow. Various types of steel pipe can be used, including spare or older upset tubing that is not being used for the well. Heavy duty pipe is also common. Joints can be welded, or use groove clamps or pipeline coupling. While steel pipe can be prone to corrosion, it can be plasti-coated to protect it. Fiberglass piping can be used where corrosion is a major concern. For low to medium pressure operations, polyethylene has become very popular. It is also well suited to situations where conditions aren’t suitable for steel. As the flow line is a surface pipeline, it’s important to keep weather conditions in mind when laying out its route. Whatever material you decide to use, it will expand in hotter weather and contract when it gets cold. Extreme cold weather can cause joints to fail and the pipe to separate. Extremely hot weather can cause the pipe to buckle. This is more likely to happen when the flow line is laid out in a straight line from the wellhead to the tank battery. 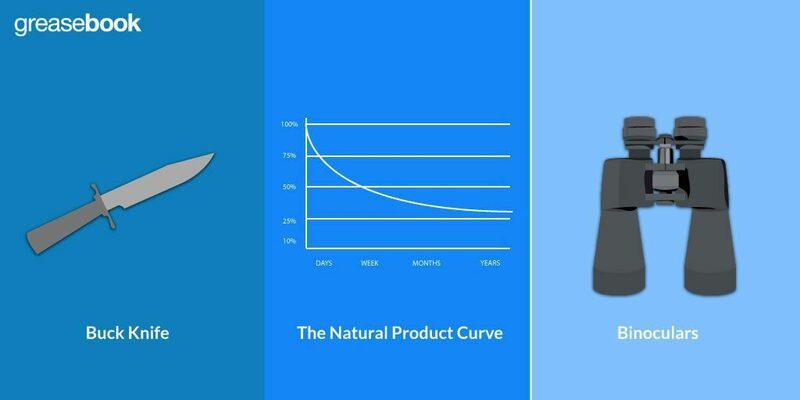 The solution is to run the pipe at a soft curve, so that the expansion and contraction won’t affect the operation of the line. Figure 2. A buried flowline crossing under a road. It is usually wise to provide some protection for the flow line. If the line has to pass under a roadway or needs to be buried for some other reason, you can protect it with casing. Sealed casing should always have a surface vent, to allow gas to dissipate if there’s a leak. It’s also important that, if you’re using steel pipe, it’s wrapped and coated properly. The header is where flow lines from different wells come together into a single collection line. A system of check valves and choke valve are installed, so that the flow from each well can be controlled and measured independently. It is possible to simply join all the flow lines together for all your wells together without using a header. However, that can cause some logistical problems. The advantage of using a header is that oil flow can be controlled and measured from a central location. Without a header, a well tester needs to be brought to each well. The other option is to shut in all but the well being tested, so that only that flow reaches the tank battery and is measured. That’s obviously less than desirable, as the shut in wells end up sitting idle. The flow lines approach the tank battery parallel to each other, with about 20 inches of separation. They turn up, through a riser, where a check valve should be installed. The purpose of the check valve is to prevent the loss of oil down the well. If there’s a hole in the line and the check valve malfunctions, the loss of pressure can cause the flow line to drop into the well. A similar problem can lead to a line’s flow reversing itself, so that it pulls oil from other wells and the tank battery. Processing of the oil usually begins at the header, where it’s possible to add chemicals. When adding processing chemicals at the tank battery, it’s standard practice to add them at the header. Another standard practice is to use quarter round valves, as they it’s easy to see if they’re open or closed quickly. It’s also important to have bypass lines for each vessel. All pressure vessels have some fittings and openings in common, while some are specific to specialized vessels. 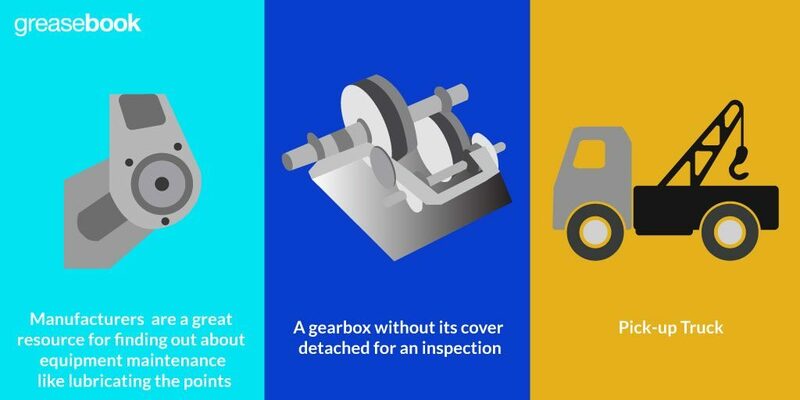 Understanding of all your equipment’s specifications is essential, but in particular it’s helpful to know some basic information. Figure 3. Common openings for pressurized tank battery vessels. Fluid enters the vessel through the emulsion inlet. 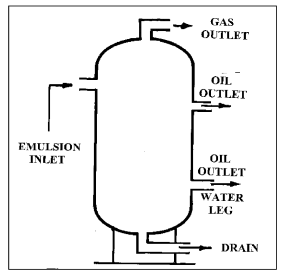 Emulsion in this case refers to the produced fluid, the combination of oil, water, and gas. The inlet is located on the side of the vessel above the level of fluid. Some vessels, for example the separator, will have a diverter plate mounted inside of the inlet. This causes the fluid to mix and turn as it enters, which helps to separate the gas from the other fluids. The inlet itself is above the fluid level so that oil is not lost back down the fluid line. At the very top of the vessel is the gas outlet, which allows the separated gas to exit. The drain outlet is at the bottom. There can be several oil outlets. One will be at the level of the top of the fluid. The second one is toward the bottom of the vessel. This can also be used as a water outlet if the vessel is a three stage separator. If there’s also a fire tube, the vessel can be used as a heater-treater. A float is used inside a vessel attached to an arm or other sensor to control the volume of fluid by opening or shutting of its flow. They’re generally divided into indiscriminate and discriminate types. Indiscriminate floats stay on top of both water and oil, and thus gauge the total volume of fluid in the vessel. Indiscriminate floats are most often ball floats, and their size can depend on a number of factors. Discriminate floats are weighted to float only on oil, and thus rest on the meeting place between oil and water. As the density of oil can vary depending on the oil’s weight, and water density depends on the salinity of the water, floats of different weights are available. Oil generally weighs about 7 pounds per gallon, while water will weigh around 9 lbs, varying with the salt content. The separator is usually the first vessel in the tank battery. It’s purpose is to separate the gas that is produced from the water and oil. Separators are not technically under high pressure, as their normal operating pressure is between 15 and 50 pounds. Their max pressure is usually up to 150 pounds, however. This vessel is pressurized primarily to push fluid to the next vessel in the tank battery. 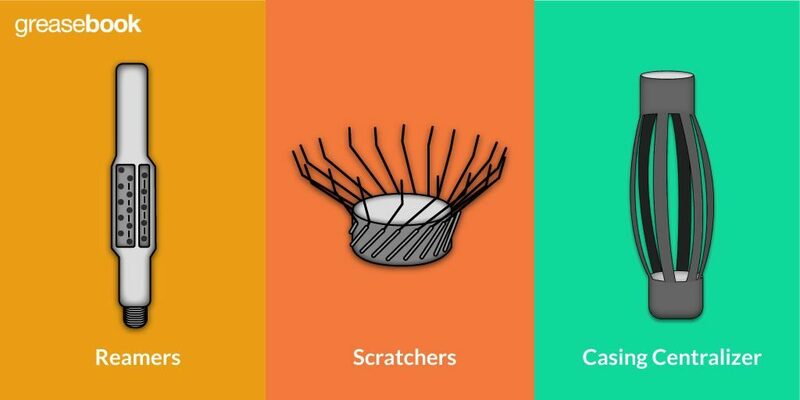 Separators can be spherical, horizontal, or vertical, which refers to the shape and internal design. They can also be two phase or three phase separators. Two phase separators are more common, and separate gas from water and oil. Three phase separators separate all three fluids from each other. A third kind is called a metering separator. It can use either a two phase system, a three phase system, or both, and both separates the three fluids and measures each of their volumes. 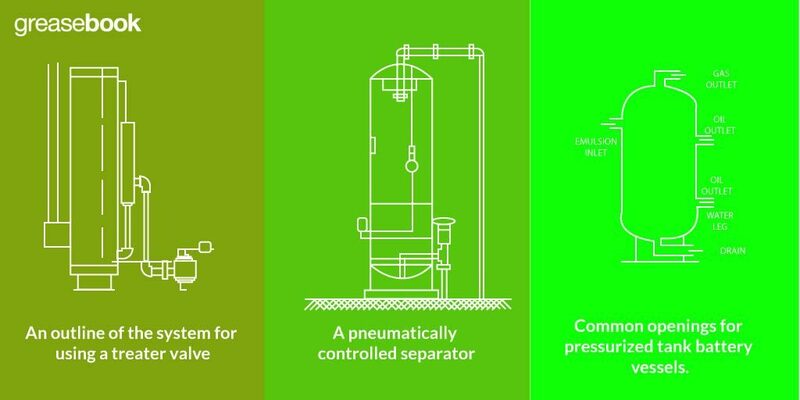 The most common in lease pumping operations is the two stage vertical separator, which comes in three basic varieties. The right-hand separator has an emulsion inlet on its right side, and the left-hand separator has an inlet on its left. A two handed separator will have an inlet on either side. Generally, whichever is better placed is used, and the extra is plugged. Fluid from the well enters at the emulsion inlet. Most separators, as mentioned earlier, will have a diverter plate near the emulsion inlet. The point of this plate is to set the fluid moving in a circular motion which encourages gas to separate from water and oil, helping to ensure that as little fluid is lost as mist is possible. Figure 4. 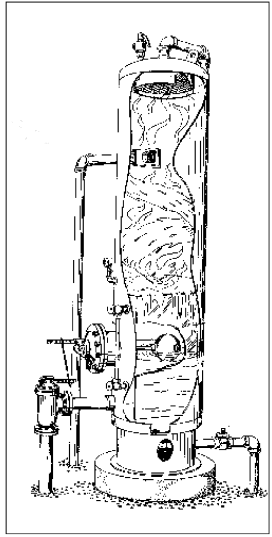 The interior of a vertical separator. The gas rises to the top of the separator, where it passes through a mist extractor. From there, the gas will pass through a valve or two and then into the gas line, which is located at the very top of the vessel. The gas is under some pressure, normally between 20 and 50 pounds, so it’s not really high pressure. After the gas has been separated, fluid is directed to the next vessel in the tank battery, most often a wash basin or heater-treater. This is controlled by a dump valve. Most newer dump valves use a small pipe or tub to draw fluid closer to the bottom of the separator, as the dump valve itself is usually higher on the vessel. That reduces the amount of water that sits in the separator, helping to reduce corrosion. The dump valve itself should be opened and closed by hand regularly to make sure it hasn’t gotten stuck. Figure 5. An example of a standard two stage vertical separator. 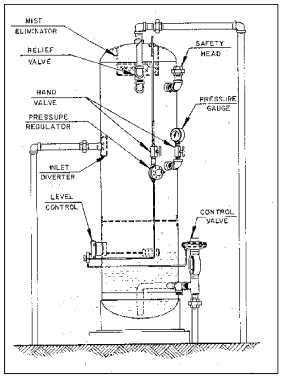 A pressure gauge should be mounted above the dump valve. A sight glass is also usually helpful in keeping track of how much fluid is being held in the separator at once. As always keeping a record of standard operations can help you recognize when there’s a problem. A sight glass usually uses two valves, one at either end. These valves can become clogged with paraffin or other substances, so they’ll often have a reamer to automatically clean those sorts of clogs out. It’s a good idea to occasionally empty a sight glass, in a sense rinsing it out, so that readings remain accurate. Figure 6. A pneumatically controlled separator. Rather than using mechanical valves, some separators may use hydraulic controls. In this case, a gas line will need to be run to supply power to the dump valve and other controls. Figure 7. A few different release valves and rupture discs. As the separator is under pressure, there are a couple of safety devices to prevent overpressure. First, there is the pop-off, more technically known as a relief valve. The relief valve is set to open near, but still a bit below, the pressure limit for the separator. It’s usually designed to need little or no maintenance, and will open and close automatically to regulate pressure. 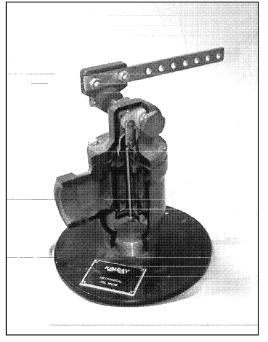 The second device is the rupture disc, also known as the safety head. This a thin dome of metal, usually steel or aluminum. Some older separators may use brass. The disc is designed to rupture at a pressure slightly higher than the relief valve opens. If the valve doesn’t open for some reason, the disc breaks instead, releasing the pressure. Unlike the relief valve, once the disk breaks it releases gas into the air until a valve is manually shut to stop it. It may be a good idea to run a pipe from the disc to a disposal pit so that escaping fluids and gas don’t contaminate the area. This pipe will rarely get used, but frozen water and corrosion can be serious problems when it is. A good route and grade that prevents the collection of water is essential. These are three-phase vessels that are usually larger than separators while operating at around the same pressure of about 50 pounds. They’re also usually more expensive, as the larger size requires thicker walls to hold the same pressure. The heater-treater is usually the second vessel in the tank battery, just after the separator. If you use a higher pressure separator, it’s possible to use a lower pressure heater-treater and save a little on its cost. Figure 8. An example of a standard vertical heater-heater. The firebox and site gauges are on the far side. As the name implies, the heater-treater uses heat as part of the separation process. In many cases, particularly during warm summers, the heat from the sun warming the tank is enough to do the job. You can just add chemicals, and it will work without any additional expense. This effectively makes it a three stage separator. You can light the firebox if the weather turns cold, though that will use natural gas as fuel which could otherwise be sold. Cost effective use of a heater-treater depends on balancing the efficiency of using natural gas as fuel vs. selling it as an additional source of income. A heater-treater is a three phase vessel, so it has three primary outlets. There is a gas line at the top of the heater-treater that collects natural gas. Somewhat below the top of tank is the oil outlet. This is also the level of total fluid in the heater-treater. There is also a water outlet for disposing of waste water. The inlet leads to a smaller compartment at the top of the tank where any gas that was not removed in the separator is piped out through the gas line. The water and oil flow down through a tube to the bottom of the heater treater. Water flows out through the water leg, while oil continues up to the oil outlet. Controlling the height of the water column in the heater-treater is an important aspect of using the heater treater. The level of water should be about one foot above the fire tube. In other words, water fills the space from the bottom of the tank to one foot above the fire tube, with oil above that. As oil flows from the inlet tube and up, it will flow past and around the fire tube. The water stays at the bottom of the tank and stays relatively cool. The oil absorbs most of the heat as it rises and leaves through the oil outlet. The inside of this part of the heater-treater has several horizontal plates with offset openings. Any water hits the plates and falls back to the bottom, while the heated oil continues upward. Any remaining gas is also separated at this point, through a tube at the top of the tank. This tube also helps maintain the pressure, and thus the water level, of the water in the water leg. Separated oil flows out through the oil outlet and into the oil line. Likewise, water flows through the water leg and out. Both the oil line and water disposal line should use back pressure valves, which only open when a certain amount of pressure is applied from the upstream side. As the oil line fills up above the valve, pressure grows until the valve opens. That usually happens when four or five feet of fluid has collected above the valve. 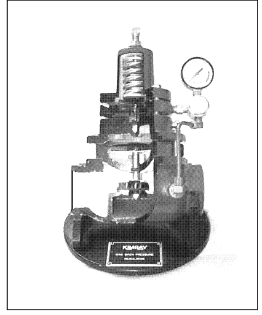 Once the collected column of fluid has passed through the valve the pressure drops and the valve closes once more. 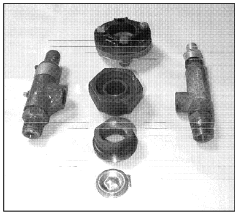 Treater valves, like that shown in Figure 11 are good choices for these valve. 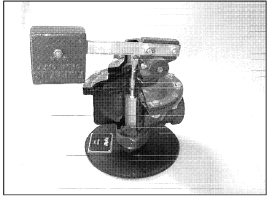 The dump valve in Figure 13 is float controlled, and of a type that is popular with lease pumpers for its reliability and versatility. The pressure exerted below the valve seat is transferred to its top, which helps with the ease and reliability of the valve’s operation. It can also be turned to operate in the opposite direction. The water leg is a name applied to the secondary tube on the right side of Figure 13. Rather than using floats and arms to open valves, the heater treater simply uses line height and gravity flow for operation. As the fluid enters from the highest opening in the tank, it continues to flow throughout the system to the slightly lower oil outlet. 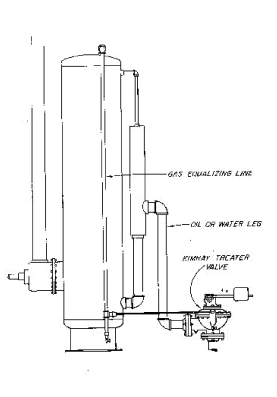 The height of water in the water leg will equal the height of the total column of oil and water in the heater-treater. Water flows from the bottom of the heater-treater and up the interior tube of the water leg. It flows over the top of the inside tube and the collects in the outer tube until the pressure is enough to open the valve. The amount of water in the heater-treater can be controlled by raising or lowering the side boot on the water leg.